Trello is an online task management software that improves productivity and communication between team members. It’s a flexible system that allows users to manage to-do lists, tasks, ideas, and plans. Trello is popular among online collaborators, digital agencies, development teams, and anyone that organizes work processes over the Internet because of its ease of use and flexibility. Trello offers getting started guide if you want to learn more about the features and functions of their software. Why integrate Trello and SEMrush? Integrating Trello allows you to take insights directly from SEMrush and turn them into action plans for your team. Sending a task from SEMrush to Trello is quick and easy - with SEMrush’s deep analysis and Trello’s flexibility - it’s an easy way to manage your website’s health and visibility. Site Audit gives you a list of issues found on your website that should be fixed to improve SEO. When you’re in the Issues report, you can look closely at a particular problem on your site and send the task to Trello. This creates a card in your Trello board reminding you to fix the issue on your website. 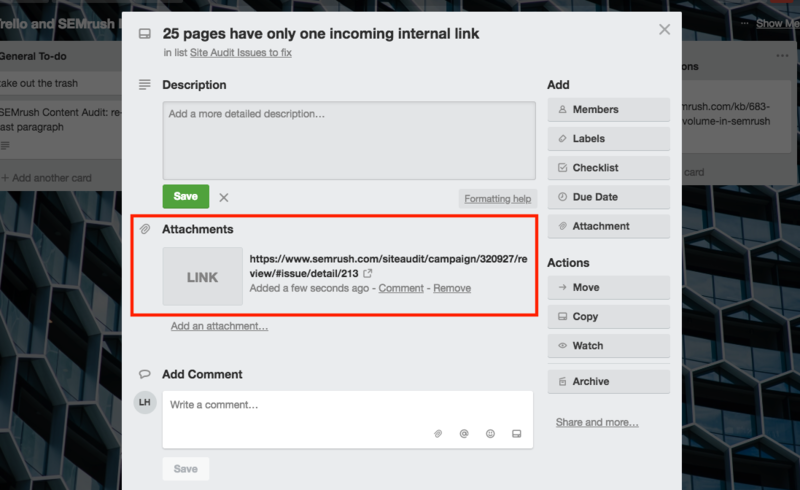 The card will automatically have a link back to the Site Audit report on SEMrush so you or your team can reference the issue directly. On Page SEO Checker gives you a list of recommendations to improve the SEO of pages on your website, based on the target keywords you want each page to rank for. When you review one of your pages in the Optimization Ideas report, you can send the information directly to a Trello board as a card. The resulting card will say the URL of the page to optimize and also leave a link back to the report in SEMrush so you can review the SEO recommendations for that page. Once your ideas are in Trello, you can manage them yourself or invite your team to complete the task in an organized manner! The Topic Research tool helps you brainstorm ideas for content. After entering a word or phrase, SEMrush gives you cards and a mind-map of subtopics that you could write about on your website to boost SEO and get more authority. The Topic Research Trello integration lets you grab these idea cards and send them to a list in a Trello board. 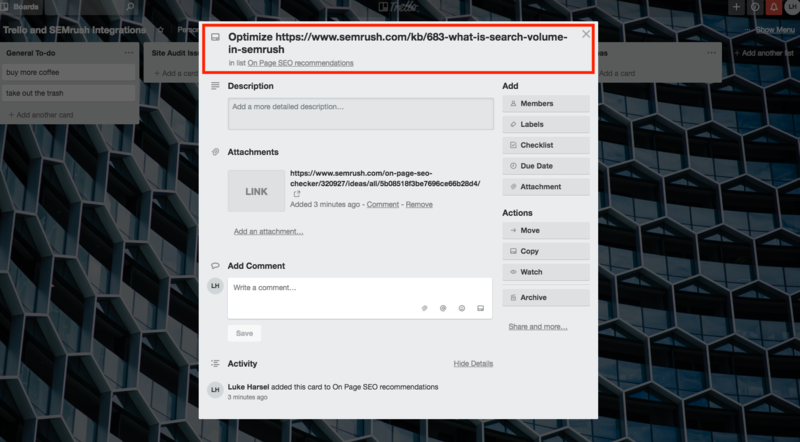 This way, you can take your topical research from SEMrush and share the ideas directly with team-members that share your Trello board. The Content Audit tool helps you audit content sections of your website, set up a workflow and track progress. 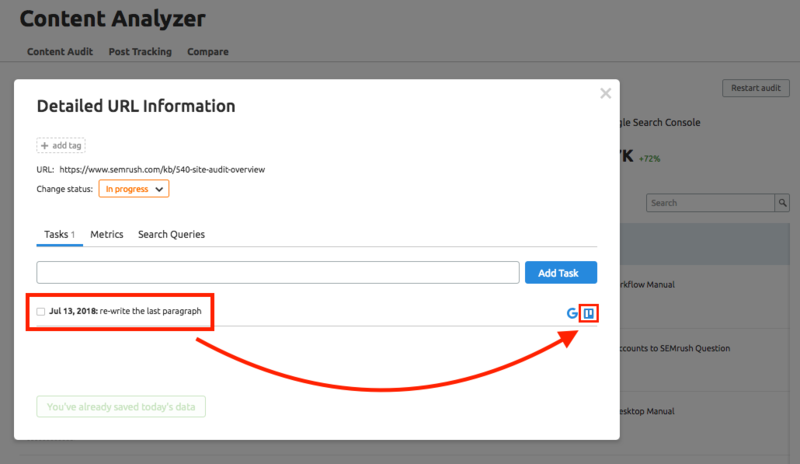 Part of this tool’s workflow is creating “tasks” to assign to team-members that can work on pages. After you create a task, you can send it to Trello to collaborate with the rest of your team. Next thing you know, you’ll have plenty of work cut out for you and your team in an organized system!